Ormat Technologies, Inc. announced today that its wholly-owned subsidiary Ormat Nevada Inc. fulfilled all conditions precedent and achieved financial closing under the previously announced equity transaction with Northleaf Capital Partners. One of the most unique fish farms in the world is in Iceland. In Reykjanesbær the Norwegian company Stolt Sea Farm breeds Senegal sole using hot seawater that went unused to the sea a few years ago. The fish farm is the only one of it’s kind in the world. At HS Orka geothermal power plant seawater is used to cool the turbines. In doing so the temperature of the seawater rises to 35°C. Stolt Sea Farm then brings it back down to 22°C which is the optimum temperature for raising Senegal sole. Before Stolt Sea Farm came to be the cooling seawater was pumped out to sea along with excess geothermal water from the plant. When the cooling seawater is used by Stolt temperature in the wastewater pipe rises to 50-75°C. Stolt then pumps its wastewater back into the pipe cooling it back down. High temperature in the pipe lowers the risk of infection and live fish escaping from the farm. Today is the final day to secure discounted hotel rates for the GTO Peer Review on May 11, 2015! Click here to reserve your room at the beautiful Westin Westminster Hotel. Learn more at our Energy Department website! The social highlight of the geothermal energy industry is the GRC Annual Banquet at the GRC Annual Meeting & GEA Expo. This year the event will be held on the evening of Monday, September 21 at the National Automobile Museum in Reno, Nevada, USA. The National Automobile Museum (The Harrah Collection) has a “Wow!” factor you don’t often find in a museum. You’ll see more than 200 eye-popping cars with authentic street scenes and sounds. The facades bring displays to life; a hardware store here, a movie theater there which accompany artifacts from each era. Buy your tickets for this geothermal event when you register for the GRC Annual Meeting & GEA Expo - registration opens in July. Kenya Electricity Generating Company (KenGen) has completed the feasibility study for refurbishment of the existing 45 MW Olkaria I power plant. The power plant was commissioned between 1981 and 1985 and has been in operation since then. KenGen now intends to undertake implementation of the redevelopment for the existing Olkaria I Geothermal power plant. The project will involve upgrading the existing 45 MW power plant to 50.7 MW. The Government of Kenya and KenGen are seeking financing from international funding institutions to finance the redevelopment of the Olkaria I geothermal power plant project. KenGen, the Implementing Agency for the proposed project now invites interested and qualified Consultants to submit their Expression of Interest for the design and supervision of implementation of the redevelopment for Olkaria I Geothermal Power Project. The Consultancy implementation period for the project is estimated at 35 months and the consultant's services are expected to commence around July 2015. Expressions of interest shall be submitted not later than 1400 Hrs on May 25, 2015. The new edition of the EGEC newsletter is out now. A joint House-Senate committee in Hawaii agreed in a compromise on House Bill 623 to set 2045 as the target year for obtaining 100% of the state's electricity from renewables. The Senate had wanted 2050 and the House had wanted 2040. The bill will now return to the Senate and the House. If approved by both bodies, the bill will then be sent to the governor's office for his signature. A 100% renewables mandate would be the most ambitious by far in the U.S.
Hawaii obtained approximately 18% of its electricity from renewables in 2013, but has ambitious plans to grow that number. Hawaiian Electric Co. (HECO), the state’s dominant electricity supplier, filed a plan last summer with state regulators proposing to obtain 65% of its electricity from renewables by 2030. If you need a sleeping room while you're in Reno for the upcoming U.S. National Geothermal Summit, please remember to book your discounted room at the Grand Sierra Resort and Casino by THIS Sunday, May 3. Make your room reservation online or call reservations at 800-648-5080. If you call in to make your reservation, please make sure to say that you are with the Geothermal Energy Association group. The National Geothermal Summit is the leading forum for western state policy discussions, bringing together the geothermal industry for a dialogue with state and federal policy makers and is widely attended by the geothermal community, state regulators, federal legislators and utilities. 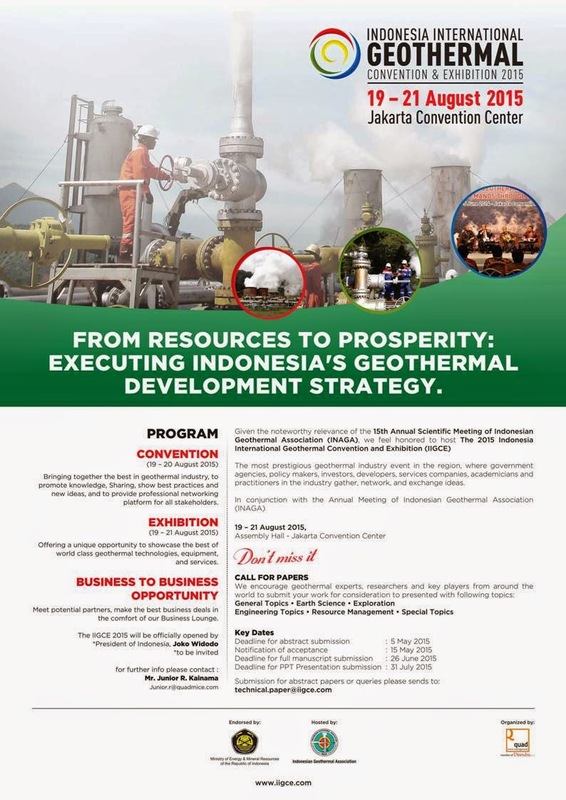 The 2015 Summit theme is “Geothermal Policies as Stimulus for Economic Growth and Environmental Quality.” The event is supported by the Geothermal Resources Council. The Indonesian government plans by the end of this year to offer more incentives to local and foreign investors who use technology that reduces pollution and conserves energy. The Environment and Forestry Ministry is finalizing policies that will provide the companies with soft-loan facilities, longer business permits and free import duties, said Siti Nurbaya, the environment and forestry minister. The government has identified nine business areas that can contribute to environmental preservation and are currently eligible for tax allowance. These are the exploitation of geothermal power, refining and natural gas processing industry, organic basic chemical industry, agricultural industry, gas tube lights industry, power generation, clean water reservoir and purification industry, eco-friendly urban transportation industry, eco-tourism and waste management industry. Abdourahman Omar Haga moves his hand over a fissure in a lava lake on the edge of Djibouti’s Ghoubbet el Kharab sea, trying to detect hot vapors invisible to the naked eye in the searing midday sun. “Can you feel it?” the 59-year-old geologist asks before offering a word of caution: placing one’s hand near the deep crack in the black rock feels like being too close to a steaming kettle. “It’s very hot!” says Haga, who has spent the past three decades looking for ways to tap Djibouti’s geothermal potential. The site, known as Asal-Fiale, is one of more than a dozen areas the government says may produce at least 1,000 megawatts of electricity. Generating power from steam forms part of the state’s plan to become completely reliant on renewable energy by the end of the decade and cut electricity costs that the African Development Bank says are among the highest in the world. Mild winter temperatures across the U.S. west reduced generation during the period. U.S. Geothermal Inc. provides this update on the results of its three operating projects for the first quarter of 2015, and the status of development activities. The three operating plants produced 95,926 megawatt-hours during the first quarter, which compares to 98,884 megawatt hours during the first quarter of 2014, a 3% reduction in generation. Mild winter temperatures across the west, which averaged 6-7°F warmer than normal during the quarter, reduced generation during the period. Planned annual maintenance outages for all three facilities will take place during the second quarter. An updated steam reserve estimate for the WGP Geysers project, California, which incorporated the past five years of wellfield pressure data and the increased injection rate from the hybrid plant design, was completed in March by an independent geothermal reservoir consulting firm. The report supports past analysis that the project has 30 megawatts gross steam capacity already behind pipe and that a 27.4 net megawatt plant can be supported for a 20-30 year project life. A detailed reservoir analysis will be prepared upon completion of the flow test planned for this spring. Upon completion of the reservoir analysis and power plant optimization, the size of the new plant will be finalized. Sometimes it seems that the more you look for a solution, the more you tend to overlook those right under your nose—or way under your feet. The problem in this case is the quickening pace of climate change, which threatens to displace millions of human beings in our lifetime, according to an endless number of sources. Some possible solutions have been around for as long as the Earth itself: wind, sun and water. In the case of geothermal energy, however, the topic is typically relegated to the backburner, which is strange given the impressive implications of the technology. It all starts in the Earth’s crust. The Earth’s crust is made up of hot rock— where temperatures reach upwards of 350 degrees Fahrenheit— that can be harnessed to generate electricity. By utilizing water heated in the crust, geothermal power facilities can generate electricity with steam. Governor Edmund G. Brown Jr. today issued an executive order to establish a California greenhouse gas reduction target of 40 percent below 1990 levels by 2030 – the most aggressive benchmark enacted by any government in North America to reduce dangerous carbon emissions over the next decade and a half. The Governor's executive order aligns California's greenhouse gas reduction targets with those of leading international governments ahead of the United Nations Climate Change Conference in Paris later this year. The 28-nation European Union, for instance, set the same target for 2030 just last October. The National Renewable Energy Laboratory (NREL) is seeking a Laboratory Program Manager (LPM) for activities in support of the Geothermal Technologies Office (GTO), within the Office of Energy Efficiency and Renewable Energy (EERE), U.S. Department of Energy (DOE). This position reports to the NREL Associate Laboratory Director for Technology Program Development and Management and interacts with research centers and offices at NREL that have major roles in geothermal technology research, development, analysis and deployment. Breakthrough technology called Enhanced Geothermal Systems (EGS) can generate electricity anywhere there is hot rock at depth, greatly expanding the potential for geothermal power in the United States. 10. Geothermal technologies use the naturally occurring heat located in shallow ground, hot water and rock below the earth’s surface to generate electricity. Geothermal is considered a renewable source of energy because the earth’s core generates nearly unlimited heat. 9. The United States generates more electricity through geothermal energy than any other country in the world. The leading state -- California -- generates 79 percent of the nation’s geothermal electricity. 8. With current geothermal technologies, electricity can be generated only where three key conditions are met: heat, fluid and natural permeability at depth. Small underground pathways conduct fluids through the hot rocks, carrying energy in the form of heat through wells to Earth’s surface, driving turbines and generating electricity. 7. Breakthrough technology called Enhanced Geothermal Systems -- or EGS -- can generate electricity anywhere there is hot rock at depth, greatly expanding the potential for geothermal power in the United States. 6. EGS are man-made reservoirs created by drilling wells thousands of feet below the earth to access hot rock at the earth’s crust. Highly pressurized cold water is pumped through the wells to cause pre-existing fractures of the hot rock to open up, increasing permeability. This enables the water to flow through the cracked rock and pick up heat. The resulting hot water pumps back to the surface where it is depressurized to make steam, which spins a turbine to generate electricity. The water is then cooled and pumped through the wells again, repeating the same process and creating a closed-loop system. Check out this infographic to learn more about how EGS works. 5. The Energy Department supports research and development at five active EGS demonstration projects in Nevada, Idaho, Oregon and California. 4. The U.S. Geological Survey estimates that EGS could provide 100 gigawatts of geothermal resource capacity in the United States -- enough to power about 100 million homes. 3. EGS provides power around the clock and emits little to no greenhouse gases. The technology also allows for geothermal development outside of the western United States, where most hydrothermal resources are located. 2. The Energy Department’s future Frontier Observatory for Research in Geothermal Energy, called FORGE, will be the first-of-its-kind field laboratory that will enable scientists and researchers to develop, test and accelerate breakthroughs in EGS technologies. 1. When it is fully implemented in 2020, FORGE will also allow researchers to collect and disseminate data in real time and identify low-risk, replicable pathways to commercial EGS development. Learn more about FORGE and the Energy Department’s work related to EGS. Also, watch this animation to see how EGS works. For a better energy efficiency and to limit the number of probes, it was decided to dig down to 800m. Japan should aim to make nuclear energy account for between 20 and 22 percent of the country's electricity mix by 2030, the country's Ministry of Economy, Trade and Industry said on Tuesday. The government expects to finalize the plan for the electricity mix before the end of May. The industry ministry also predicted electricity demand in the year starting April 2030 would total 980.8 billion kilowatt hours (kWh), up 1.5 percent from 966.6 billion kWh in the year through March 2014. Generating electricity from the hot rocks deep underground is clean, safe and renewable - and it's about to take a step forward in Utah. The U.S. Department of Energy announced Monday that a team from the University of Utah's Energy & Geoscience Institute (EGI) is one of five research groups selected to study new techniques for developing geothermal energy in places where it's not currently feasible. EGI is part of the U's College of Engineering. The U team of geologists and engineers, led by EGI research professor Joseph Moore, also a GRC Board Member, will evaluate establishing an underground geothermal laboratory about 10 miles north of Milford, Beaver County, within the Milford renewable energy corridor. This corridor is home to two geothermal plants and a 306-megawatt wind farm. Utah's geothermal power plants provide enough electricity to power nearly 70,000 homes in Utah, California and Arizona. "This is really game-changing technology in terms of being able to develop self-sustainable energy for the U.S.," says Moore, who also is a geologist. Chicago-based firm New Generation Power International (NGPI) said Tuesday it will install and operate a 100 MW geothermal power plant in northwestern Turkey together with three local companies. The independent power producer is forming a joint venture for the project with Yilsan Holding, Mineks International and DCM Energy. The total investment in the geothermal plant is estimated at about USD 400 million (EUR 366m). The partners aim to complete the first 10 MW of capacity by end-2015. Another 40 MW are planned to be up and running by the end of next year and the final 50 MW are expected to reach completion and start operation before the end of 2017. The American Council On Renewable Energy (ARENA) is pleased to present the new EnergyFactCheck! America's energy portfolio – and the debate shaping that portfolio – is changing. A credible voice for the clean energy industry has never been more important. Ahead of the next presidential election cycle and America's rapidly evolving energy infrastructure, we redesigned EnergyFactCheck to ensure it remains a relevant, useful resource for communicators, policymakers, and everyday citizens alike. Here are some of the new features we've added to EnergyFactCheck.org. The European Geothermal Energy Council (EGEC) publishes a policy paper arguing its case for more renewable energy to be included in the EU Energy Plan. The EU’s energy security is at risk. Europe is hugely dependent on fossil fuel imports, in particular on the natural gas used to cover its extensive heating demand. With the increasing deployment of variable renewables, the EU electrical system requires more flexible generation. Natural gas as backup must be discarded: the more it is used, the more the EU is dependent on energy imports, and the more it moves away from achieving energy security. With the new Energy Union, the only viable option to address this challenge is to improve energy efficiency and to replace fossil fuel consumption and imports with stable renewable energy sources in the heating and electricity sectors. Energy efficiency is not sufficient to solve such a long-standing structural problem. Such a path requires political courage and structural reforms in the years to come. In order to prepare the ground, EGEC publishes today an action plan towards “Fuel switch to renewables in the heating and electricity sectors”. This paper provides case studies of how to switch fuel with different geothermal technologies and puts forward key recommendations to build a resilient Energy Union. As Australia further concretes its dependence on coal, New Zealand's recent investment in alternatives is already bearing fruit. Usually this time of year is wet and New Zealand's hydro-lakes would be full, but an unseasonably dry autumn has left reserves 30 percent lower than average. This would usually be cause for concern, but the country's backing of geothermal power means they're still pretty sweet. The New Zealand Minister of Energy and Resources, Simon Bridges said the current geothermal renaissance puts the country in good stead to hit the target of 90 percent renewable generation by 2025. As Bridges boasted at the World Geothermal Congress, New Zealand is now the fifth largest geothermal power generator in the world. Meanwhile, across the ditch in Australia, a country with more than five times the population and 28 times the land mass, the governing party seems increasingly fixated on fossil fuels. Experienced lawyer Gershom Otachi has been appointed chairperson of Geothermal Development Company (GDC) in Kenya. Gershom Otachi Bw’Omanwa is an Advocate of the High Court of Kenya of 23 years standing, a Senior Partner at Ogetto, Otachi & Company Advocates and also the firm’s co-founding partner. Otachi holds an LL.B (Hons) degree from the University of Nairobi and was admitted to the bar in 1991. The U.S. Department of Energy was granted a U.S. patent for the technology and is now seeking licensing opportunities for potential commercialization. The research was sponsored by a Department of Energy grant. The researchers’ high-frequency matrix converter addresses these shortcomings. Its simplified control system uses power converters to allow connection of a variety of power sources to a small, high-frequency transformer. Then, using a high-frequency matrix converter, it produces stable electricity ready to be supplied to the electrical grid system. Emerging Power, Inc. (EPI) has tapped Iceland Drilling Corp. (IDC) to conduct drilling works for its planned 40 MW geothermal project in Oriental Mindoro. The renewable energy company said in a statement over the weekend that Iceland Drilling Corp. will undertake the drilling activity for the $185-million Montelago project. Under a deal inked last April 20, IDC will drill at least two wells starting in July. Iceland Drilling will use a Geysir Drillmec HH-20SS equipment -- a trailer mounted, fast moving, automatic, hydraulic rotary drilling rig with a drilling depth capability of 4,000 meters. The heavy-equipment has been previously used in a geothermal drilling project in Biliran. Expected to be operational by 2016, the Montelago project straddles barangays Montelago, Montemayor and Melgar-B in the municipality of Naujan, Oriental Mindoro. The GRC reminds interested individuals to sign-up for the GRC Workshop/Field-trip to Yellowstone National Park as places are filling fast. The workshop will include a tour of the major geologic features of the park, the site of the greatest concentration of geothermal features in the world, and discussions of its volcanic history, geochemistry, and hydrology. Limited number of spaces are available. Aluto is Ethiopia's main source of geothermal energy, a low-carbon resource that is expected to grow considerably in the near future. In their open access paper published in Geosphere this month, William Hutchison and colleagues present new data from Ethiopia's Rift Valley and Aluto volcano, a major volcano in the region. Aluto is Ethiopia's main source of geothermal energy, a low-carbon resource that is expected to grow considerably in the near future. Preexisting volcanic and tectonic structures have played a key role in the development of the Aluto volcanic complex and continue to facilitate the expulsion of gases and geothermal fluids. Using high-resolution airborne imagery, field observations, and CO2 degassing data, the authors explore in great detail how these preexisting structures control fluid pathways and spatial patterns of volcanism, hydrothermal alteration, and degassing. Understanding these preexisting structures, they write, "Is a major task toward defining the evolution of rift zones and also has important implications for geothermal exploration, mineralization, and the assessment of volcanic hazard." Structural controls on fluid pathways in an active rift system: A case study of the Aluto volcanic complex, William Hutchison et al., COMET, University of Oxford, Oxford, UK. The State of California has recognized the month of May 2015 as Geothermal Awareness Month through a resolution of the State Legislature. Geothermal Awareness Month aims "to raise awareness of the significant contributions geothermal energy makes to California's Renewable Portfolio Standard and towards meeting the state's environmental goals to reduce greenhouse gas emissions," states the resolution. "The Legislature considers geothermal resources important to California's future and recognizes the environmental and economic values of existing and future geothermal energy for the state and local communities." In celebration of Geothermal Awareness Month, GRC member Calpine Corporation will host a celebration on Saturday, May 2 that includes guided tours of its geothermal power plants as well as music, booths and live entertainment. The event is from 10:00 a.m. to 3:00 p.m. at the Calpine Geothermal Visitors Center, 15500 Central Park Rd Middletown, CA 95461. Central Oregon lawmakers have won their colleagues' backing in a bid to bring a lucrative federal geothermal research site to the flanks of the Newberry Volcano near La Pine. State Rep. Gene Whisnant (R-Sunriver) sponsored and carried House Joint Memorial 19 (HJM 19) successfully on the House floor Thursday with a unanimous vote of passage. HJM 19 urges the Secretary of Energy and Congress to site the U.S. Department of Energy's Frontier Observatory for Research in Geothermal Energy (FORGE) at the Newberry Geothermal Project in Deschutes County. The FORGE will perform advanced research on enhanced geothermal systems for the purpose of developing large-scale, economically sustained heat exchange systems. We are more than 1500 members of the global geothermal community, representing more than 75 countries, who have gathered together in Melbourne, Australia, for the World Geothermal Congress 2015. We share a common interest in geothermal resources, stimulated by the promises and challenges they present. Participants have shared in short courses and field trips in New Zealand and Australia, where geothermal development and preservation initiatives provide examples from which the rest of the world can learn. We acknowledge a debt to those before us who built a solid base of knowledge and experience, as we create better outcomes for energy efficiency and delivery around the world. Advanced economies rely on the efficient and reliable availability of energy. The energy options we currently have can be considered gifts from our ancestors. We are responsible for their sustainable management so that our endowment of natural resources can continue to meet the needs of future generations. Geothermal energy sits within a suite of clean and sustainable energy options, providing benefits beyond simple energy delivery in terms of sustaining the health of the environment in which we live. Geothermal resources soothe bodies, warm homes and hotels, and supply heat for commerce, industry and agriculture. They provide the clean raw fuel for an expanding base of electricity generation. New opportunities are opening for the harvesting of valuable minerals carried within geothermal fluids, and for understanding the extreme life forms that survive within these fluids. Geothermal resources are indigenous; they are sustainable; their use is environmentally responsible; their high availability is largely independent of weather and climate; they displace carbon-intensive energy resources. Geothermal energy can be considered a global resource. In some places, geothermal resources already provide the most cost effective option for power and heat generation, representing a sound financial investment choice. • Finally, we urge governments and academic institutions to cooperate to transfer knowledge from geothermally experienced to less experienced countries, through training and education, capacity building, and technical assistance. Through these actions, our common goal is to improve the living standards of citizens of the world through the supply of indigenous, affordable, environmentally responsible energy for generations to come, while preserving a portion of geothermal resources in an undisturbed state for all time. The Geothermal Energy Association (GEA) has announced a preliminary agenda for its fifth annual National Geothermal Summit at the Grand Sierra Resort and Casino in Reno, Nevada on June 3-4, 2015. Panel Discussion - What are the three critical success factors for geothermal? The GRC is hosting a Workshop/Field-trip to Yellowstone National Park, June 22-26. The workshop will include a tour of the major geologic features of the Park, the site of the greatest concentration of geothermal features in the world, and discussions of its volcanic history, geochemistry, and hydrology. (Addressing readers at WGC 2015): Australian investors seeking international renewable energy opportunities should consider geothermal energy in Italy. The European power market is rapidly transitioning towards renewable technologies under strong EU climate change and energy security policies and in certain countries local, climate-friendly, geothermal energy is making a significant contribution to utility-scale electricity and heating supplies. Australian familiarity with geological risk should be able to provide an investment boost. Italy, in particular, offers all of the necessary components of successful geothermal power projects except for sufficient finance. While some of these components are more or less attractive compared to those in other geothermal countries their overall combination highlights Italy as a compelling geothermal investment destination. Lecture: 'Geothermal Features of Yellowstone, Iceland and Nevada' - Tonight! Dr. Chip Carroon is presenting a slide lecture titled “Geothermal Features of Yellowstone, Iceland and Nevada,” which answers the question, what do Yellowstone National Park and Iceland have in common with Nevada? The presentation, at 6:30 p.m. April 23 at the Nevada State Museum, will focus on the geologic origin of geothermal and volcanic features of Yellowstone, Iceland and Nevada, three of the most geothermally active places in the world. Doors open at 6 p.m. for exhibit viewing in the main building. Museum members and children under 17 have free entry; nonmember admission is $8 per adult. Contact Energy has been at the forefront of renewable energy generation in New Zealand for some time. The pioneering Wairākei power station, commissioned in 1958, was the second significant geothermal power station in the world to be built and Contact's newest power station, Te Mihi, was officially opened in 2014. View the video to find out more about their geothermal expertise, recent projects and innovations. Though the technology has yet to be applied broadly, early results are promising. As part of his continued work to find new ways to fight climate change while lowering energy prices for U.S. consumers, Senator Ron Wyden, D-Oregon, today introduced a pair of bills that would boost domestic clean energy production and reduce carbon emissions. The Geothermal Energy Opportunities (GEO) Act, encourages geothermal energy production by breaking down barriers that prevent prospective geothermal projects from getting in the ground. The geothermal bill introduced today helps would-be geothermal developers explore for and develop geothermal resources through a public-private grant program. As part of the partnership, developers report their findings, contributing to a nationwide map of geothermal potential that will reduce the risk and drive down the cost of geothermal energy for the future. The bill also makes it easier for oil and gas developers to co-produce clean geothermal energy on federal lands under existing leases. A years-long effort to bring geothermal power to Unalaska may be on its last legs. The city government is draining its accounts for exploring Makushin Volcano, saying the project is too expensive and risky to pursue any further. "Right now, it’s just pretty much a dead project," says city public utilities director Dan Winters. Winters says the city is clearing out its geothermal savings. They’ve transferred an expiring federal grant to Akutan, and rolled their local match back into the city’s general fund. And soon, the state Legislature will likely take back the rest of the geothermal account -- a $1.5 million grant that was never used. For now, though, they’ll shop Makushin around to private companies alone -- and wait for a chance to bring the city back on board. When the Sierra Nevada snowpack is at 65 year low, there will be serious water shortages in California that can affect us all. Droughts can be powerful motivators for innovative water efficiency and conservation measures, and have led to the development of innovative technologies, such as desalination of brackish ground water, produced oil field water, or seawater. Certainly these technologies hold tremendous promise, particularly in places where high salinity waters outweigh the freshwater supply significantly — places like Texas, where brackish water is produced from oil and gas wells. 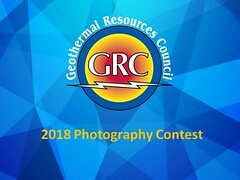 With the experience and dedication of its diverse, international membership and a 40-year plus track record, the Geothermal Resources Council (GRC) has built a solid reputation as one of the world’s premier geothermal associations. The GRC serves as a focal point for continuing professional development for its members through its outreach, information transfer and education services. Current GRC Members can update profile information, renew membership or search the Membership Database by using your Member ID and Password. A comprehensive platform to facilitate the effective development of renewable energy projects worldwide is now available online. The Project Navigator tool, launched today by the International Renewable Energy Agency (IRENA), provides project developers with the knowledge, tools, case studies and best practices needed to support the successful completion of their projects. Many promising renewable energy project ideas are not implemented due to a lack of knowledge or expertise on how to move them forward. Successful projects are characterized by robust technology data, strong project proposals, and the inclusion of financing instruments and information for investment analysis. The Project Navigator aims to increase the percentage of successful renewable energy project proposals worldwide.